Originaly, I planed to report weekly about the news during the construction of my station "Albula Summit". But there was so much work and other things happened, that I did not find the time to update this pages. 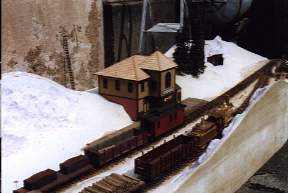 This station, build up on three modules with an overall length of 10', is a small siding. 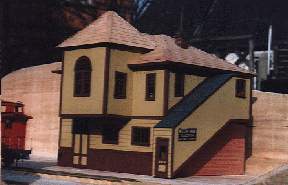 The mainreason for building this station is the Convention for American Railroadfans in Switzerland in october 1998. My friend George and I plan to participate and to show our modules there.. Sorry about the quality of the pictures. 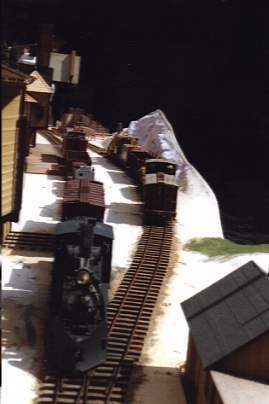 I've done the mistake to order the photos in a version, which is not very good for scanning. 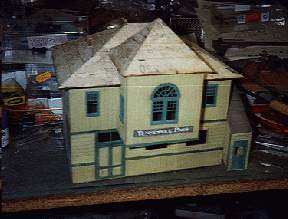 The depot-building on my workbench, as I got it from the USA. As you can see, the roofing-material was removed. It was a tarpaper-imitation as on the stairway on the right side. 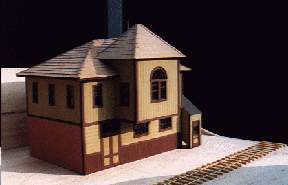 The depot-building after much work is done. 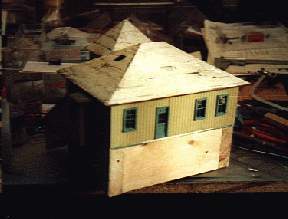 The windows and trimboards were painted in the new colour box-car-red, missing trimboards and two windows were installed, the roof is newly shingled with Builders-In-Scale-Shingles. Also, much more was done. 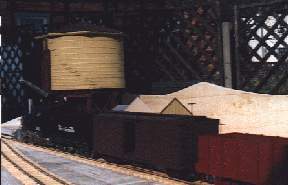 The first train in the station and arriving at the watertank. 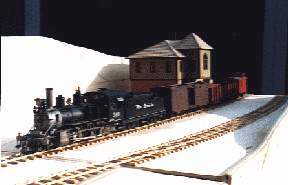 The train consist of an very old Balboa-model of a D&RGW C-21 with two SanJuan-cars and a GrandtLine-caboose. 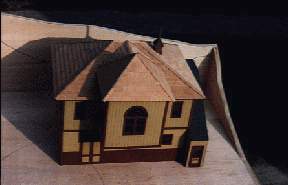 After finishing the work, you see above, I build up until the end of march 1998 all needed buildings except for one bunk-house. Also, I build up a stock-pen with loading chutes, which is based on a BTS-kit for a stock-pen with wide base prototype. In case of limited space on the modules and the wide-gauge-prototype, I build up the fences not as suggested in the kit, and also, I choosed another prototype for the loading-chutes. 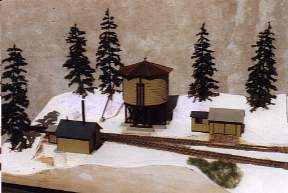 I used the plans of Harry Brunks book "Up Clear Creek On Narrow Gauge" and enlarged the drawings to 1/4" scale. 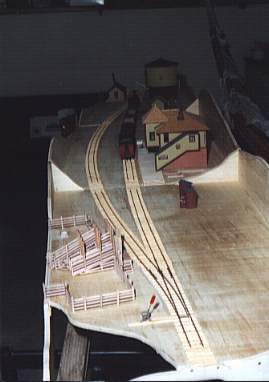 Also, I freelanced this chutes, which base on the Georgetown prototype, and added a third ramp for the cattle beside the two ramps for loading sheep in a double-deck-stockcar. The following photos show the chute during the construction, nearly finished with movable wings, which can be slide out, and two aerial-views of the modules, as they look at april, 05, 1998. 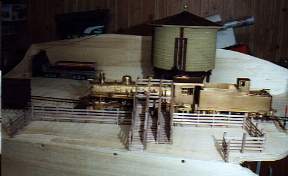 The loading chute during construction. Beside the ramps, which were setup only by gravitation without any glue between the separate ramp-parts at this time, you can see the parts for the third ramp for the cattle. 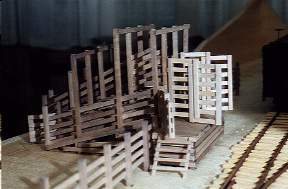 The complete stockyard, seen from the module-corner. At this time, the yard is not finished, there are still some parts missing. 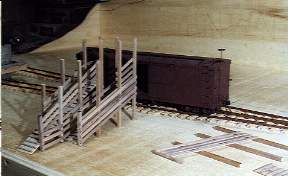 The finished loading chute with movable and sliding wings. 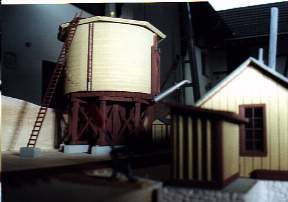 The watertank as seen from the south-west-corner of the module. 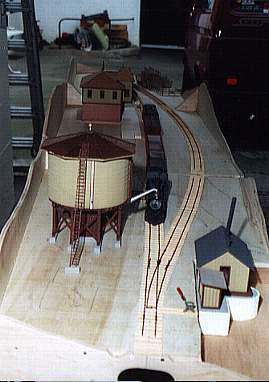 At the right side of the picture you can see the C&S "Forks Creek" pumphouse. An aerialview of the modules as seen from the western end of the station. 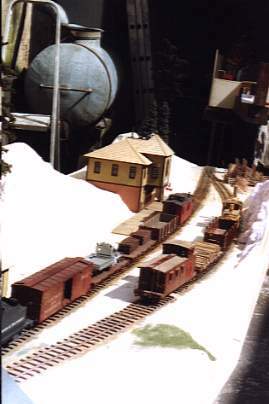 The stockyard is on the other (eastern)end of the station. 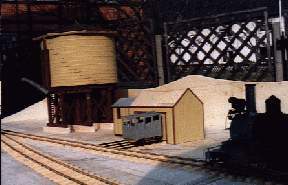 The westward view from the eastern stationend with the stockyard in the foreground and the watertank at the other end of the modules. 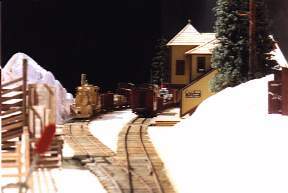 Ein Ueberblick vom oestlichen Bahnhofsende mit dem Stockyard im Vordergrund und dem Wassertumr am anderen Ende. Since april 05, 1998, the modules are at my friend and coowner Georg Wolter in Bonn. 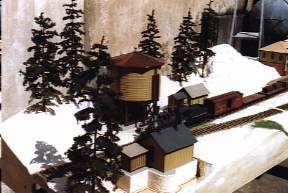 He will add the landscaping and the weathering during the next months. In the meantime the modulestation is finished and was succesful shown at the der 10th Convention for American Railroadfans in Switzerland. Because I have no space in my layoutroom at this time, the modules are now in Bonn at my friend George. Pictures about the finished modulestation can be found here. Goose #5 ist back again. 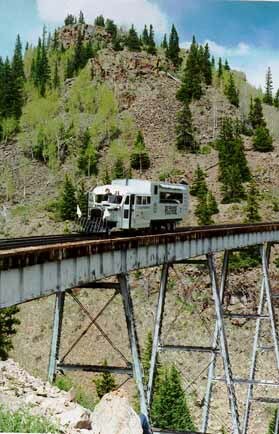 This photo shows a wonderful unique piece of railroad on june 3rd, 1998 on the Cascade trestle of the Cumbres & Toltec Scenic Railroad. More information about the restauration of #5 you can find at the Galloping Goose Historical Society of Dolores, Inc. Please sign my No form to fill out, just press the button. For questions, corrections and tips, please send an email to .